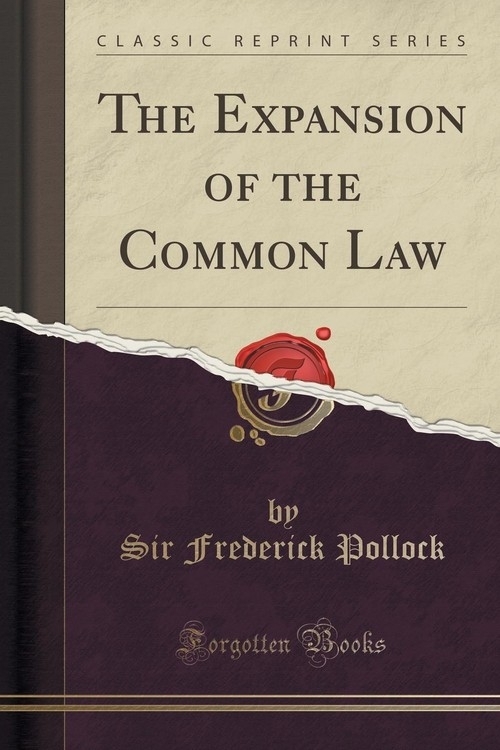 Excerpt from The Expansion of the Common Law<br><br>The lectures from which this volume is named were delivered to the Law Schools of several American Universities last autumn. A few additions have been made to the original text. The address given at the request of the Harvard Law School Association for its commemoration of 1895 was not intended at the time to have any sequel, but is now prefixed to the course of 1903 as being sufficiently germane to the matter to serve as a general introduction.<br><br>Familiar matters of both fact and law were necessarily taken for granted in delivering the lectures; and it does not now seem desirable to vouch authorities at large for them. References have been given only where it is thought that they may be really useful for verification or farther search.<br><br>About the Publisher<br><br>Forgotten Books publishes hundreds of thousands of rare and classic books. Find more at www.forgottenbooks.com<br><br>This book is a reproduction of an important historical work. Forgotten Books uses state-of-the-art technology to digitally reconstruct the work, preserving the original format whilst repairing imperfections present in the aged copy. In rare cases, an imperfection in the original, such as a blemish or missing page, may be replicated in our edition. We do, however, repair the vast majority of imperfections successfully; any imperfections that remain are intentionally left to preserve the state of such historical works.